Controversy over LA Galaxy sponsor Herbalife has become a recurring theme, but has reached new heights in recent weeks with government agencies seemingly stumbling over each other to investigate the company’s questionable business practices. No slick marketing can change the score on the board. That’s a lesson that Herbalife is going to learn as it tries to hide its predatory business practices behind its sponsorship of the LA Galaxy. It’s not uncommon in marketing for a corporation to try and attach itself to a cause that is more popular than itself. But the consumer should still be careful when the corporation buying the marketing follows a set of values very different from the product they are endorsing. No amount of cosmetic marketing can cover the fact that Herbalife is a $4.8 billion company, in large part due to the Latino community, which accounts for more than 60 percent of distributors. Yet more than 80 percent of those distributors make nothing and less than 4 percent make more than a thousand a year. This is a rip-off for Latinos. Slick marketing can always be exposed as a fraud if the company doing the sponsorship doesn’t follow the values of the product it’s endorsing. Remember the outcry during the Oscar Awards? Ellen DeGeneres used a Samsung phone during the show. After all, Samsung was sponsoring the awards. But backstage, she was seen using her own personal iPhone. People felt they had been fooled by a marketing gimmick. Unfortunately for Herbalife, no one is going to be fooled by its gimmicks. Latinos know the score and they know that Herbalife isn’t playing by the rules. This company essentially offers a predatory sales program that targets disadvantaged groups, including Latinos. Yet when the new movie on the life of Cesar Chavez was released recently, guess who sponsored some of the early screenings? Herbalife. No one was fooled then and no one will be fooled by the sponsorship of the Galaxy. This isn’t about Herbalife embracing the Latino community; this is about Herbalife taking advantage of the Latino community. Even the Federal Trade Commission has its doubts, recently launching an investigation into Herbalife’s operations, a move followed by an FBI probe, as well. The company aggressively targets lower-income Latinos with little to no business experience, including undocumented workers, who are in desperate need of a paycheck to support their families. With false get-rich-claims, they are luring these trusting, unsuspecting individuals into what we believe is an illegal pyramid scheme. Herbalife’s business model incentivizes recruitment rather than selling products, leaving those at the bottom with no recruits – and no income. As we kick off the 2014 MLS soccer season, I take joy in the fact that the sport uniquely unites us. Soccer itself teaches teamwork, discipline and accountability. Ironically, these values could not be more different from the values of Herbalife. 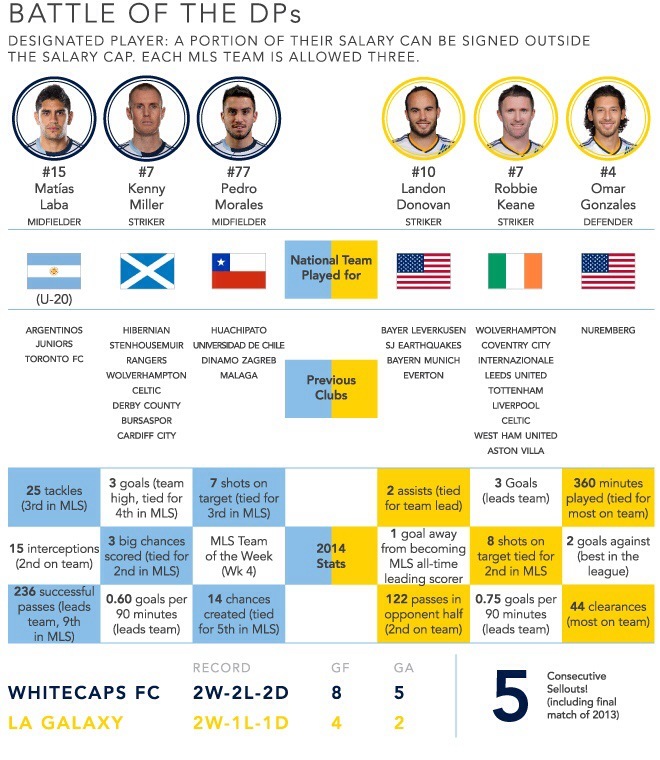 So while Herbalife helps bring soccer to our communities, it is simultaneously bringing us a predatory business model that is economically weighing us down. It’s time for companies like Herbalife to quit saying they support Latinos with their words while they work to undermine Latinos with their actions. If Herbalife really wants to endorse the Latino community, it should stop its predatory business practices immediately. Now that would be a winning score for everyone. We’re getting down to crunch time in the EPL. Live on NBC at 9:30 a.m. Saturday, relegation strugglers Norwich City will seek to take advantage of the turmoil at Manchester United this week and give interim manager Ryan Giggs some food for thought in the wake of the sacking of David Moyes. Good luck with that Canaries (and I’m a City fan). League-leading Liverpool will seek to knock Jose Mourinho’s third-place Chelsea out of the title hunt in the game of the weekend at 6 a.m. Sunday on NBCSN. Also, at noon Monday on NBCSN fourth-place Arsenal hosts Newcastle United. Your complete guide to all the games this weekend is here. An independently-produced documentary called “Next Goal Wins” opens Friday in Los Angeles. Ostensibly, it is about a ragtag team of lovable losers seeking to attain their collective dream of actually winning a game after a decade of losses including a world record 31-0 World Cup qualifying loss four years earlier. But there is a larger story in play here in this sweet modest movie as I write in this week’s column. Also, local soccer clubs and other groups can organize fundraising screenings of the movie. For more information, click here. Need to get caught up quickly with the LA Galaxy after the Easter weekend? And yes, I am already a fan of the alert, always offensive-minded Stefan Ishizaki who had a perfect response for Vancouver fans in this game. And, yes, I still remain unconvinced of the defensive qualities of Leonardo, however. One of the most dependable goalkeepers in MLS, Dan Kennedy had the misfortune of committing a rare miscue that led to Seattle’s first goal. Off a Seattle free kick into the Chivas area, defender Bobby Burling headed the ball straight up and Kennedy jumped up, got both of his hands on the ball, but it slipped away and behind him. Seattle’s Clint Dempsey got to it first and tried to direct a shot off the side of his right foot. It went off a defender and Seattle’s Lamar Neagle buried a left-footed shot to tie the game in the 25th minute. “It was just one of those things where maybe I was a little overeager to get it,” Kennedy said. “Carlos (Bocanegra) and I had a communication where I called for it and I just mistimed it. As a goalie you know you get one thing wrong, you get punished. Without prompting, Chivas USA coach Wilmer Cabrera threw caution to the wind in his postgame press conference after the Goats fell to Seattle, 2-1 Saturday at StubHub Center. Cabrera did give credit to the Sounders, he did lament the mistakes Chivas made, then got to the heart of his argument with a couple of statements that will reach the MLS principal’s office. “We’re trying to to play evenly with every team at home but we’re making some mistakes that cost us too much, so we have to improve that mentality,” Cabrera said. “And then we don’t receive the respect, and we don’t receive fair consideration from the guys that run the refereeing part. We know that. “Even at home, it’s the second game we finish with 10 men and that’s not right. Every 50-50 foul was for the other team. They’re a very good team and they won this because they scored two goals and we only scored one, but it’s a little frustrating, those calls, those issues, that red card. “Both players went for the ball (but) because Marky, a young player, Chivas USA, let’s take him out. Simple,” Cabrera said Nobody’s going to complain, nobody’s going to defend Chivas USA, nobody’s going to say anything. “It’s easy to take advantage of us because nobody complains. That’s not right. Read more in the game story. Rookie striker Thomas McNamara, who has been keeping veteran Mexican star Bofo Bautista out of the starting XI, won’t get to face former Galaxy coach Sigi Schmid and leading MLS goal scorer Clint Dempsey tonight in Carson after Chivas USA announced Friday he would need knee surgery and could well miss the rest of the season (Photo courtesy Chivas USA). 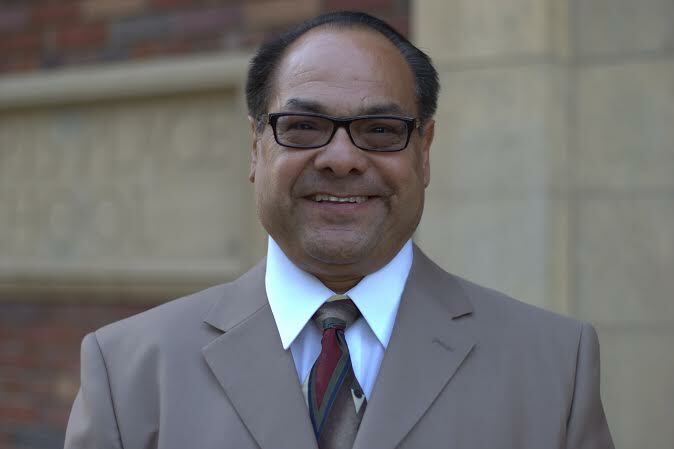 Los Angeles News Group reporter Phil Collin has the capsule game preview. Here’s how the game breaks down by the numbers. Here’s the view from the Pacific Northwest. How many in the crowd will be going to the game primarily to see Dempsey, I wonder? And what odds could you have gotten in preseason that this game would feature the league’s top two scorers? 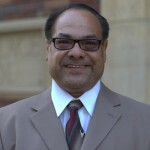 Los Angeles News Group beat writer Phil Collin has the capsule preview. Here’s the view from Vancouver. 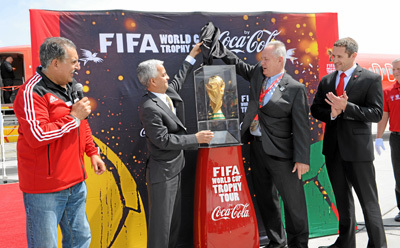 U.S. Soccer President Sunil Gulati, left, and San Fernando Valley Los Angeles Councilman Tom LaBonge unveiled the World Cup trophy at LAX Friday, the final stop on its 92,000-mile, 90-country world tour before heading south to Brazil for the FIFA World Cup. (Photo by Staff Photographer Brad Graverson). Meanwhile, the EPL season is heading toward its climax. The pick of the games this weekend sees fifth-placed Everton face seventh-place Manchester United at 8 a.m. Easter Sunday on NBCSN. A full preview of every EPL game this weekend in all its stat-laden glory is here. 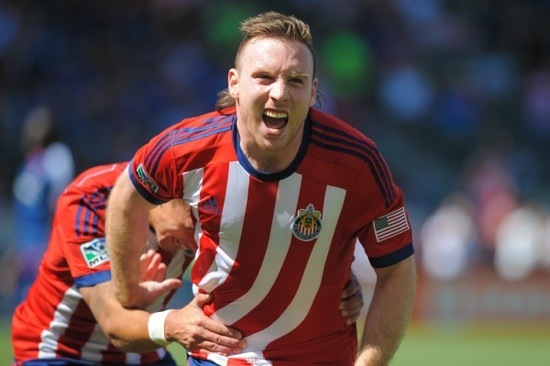 Chivas USA striker Thomas McNamara, a first team regular in his rookie year, will undergo knee surgery the club announced today, after picking up the injury in Portland last weekend against the Timbers. 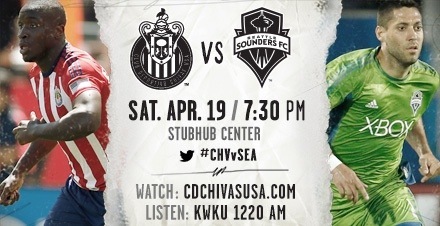 Two former Sounders — Mauro Rosales and Eriq Zavaleta — are on the Chivas USA roster, but only one of them will play this weekend. Here’s more on the Galaxy II game Saturday at the track and field stadium on the Cal State Dominguez Hills campus. 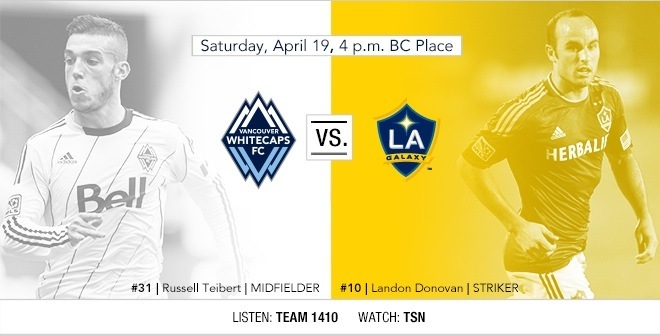 Meanwhile, Saturday is a homecoming for British Columbia native and Galaxy striker Rob Friend.